Dye Printed flags have been an integral part of JW Plant’s portfolio for over 30 years. As a pioneer in this field in the UK, we have developed our knowledge, our product and our knowledge, product and skills to become and remain a leading manufacturer of dye printed flags. As a pioneer in this field in the UK, we have developed our knowledge, our product and our knowledge, product and skills to become and remain a leading manufacturer of dye printed flags. JW Plant uses only the highest quality water dispersed dyestuffs, chemically formulated and balanced for direct polyester textile printing. Our in-house dye kitchen mixes and calibrates the dyes in order to provide an accurate colour match and to ensure that the widest colour gamut is available to our customers. This provides us with full control over the final dye pigmentation process. The final colour is saturated, it is densely impregnated into the polyester fibre and remains stable when subjected to a variety of adverse conditions such as water, chemical, abrasions and UV light. These dyes lead their class in durability, staturation,and offer a uv stability ranging from 6-8 on the Grey Scale. Our printed flags are thermally fixed at 195 degrees celcius, they are reduction cleared, providing a washable finish that is flexible, soft in its handle, and is kinder to the environment than other printing processes. JW Plant have a variety of automated and hand printing processes that provide maximum flexibility, quality and control. 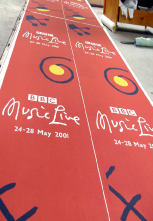 With print widths upto to 2m, and a single screen repeat in excess of 5m, our facilities lead the field in the UK. Our expertise and understanding of the processes ensure that we maintain an optimum balance between the screen mesh size, dye thickness, squeegee pressure, and the number of print passes in order to maximise the quality and impact of the print. Understanding and balancing these factors remain critical to the overall printed result, particularly to the strength of colour, face and reverse, and the overall clarity of the image.